This nearly flawless moon carving shrouded in auspicious ruyi (as you wish)–shaped clouds is supported on a base depicting the rabbit of Chinese legend who lives on the moon and who concocts the elixir of immortality. The fifth-century poem on its surface, incised by the renowned artist Zhao Pingchong in the last year of the Qianlong emperor’s reign, tells the story of an ancient ruler who, when parted from his beloved, found solace in gazing at the moon. 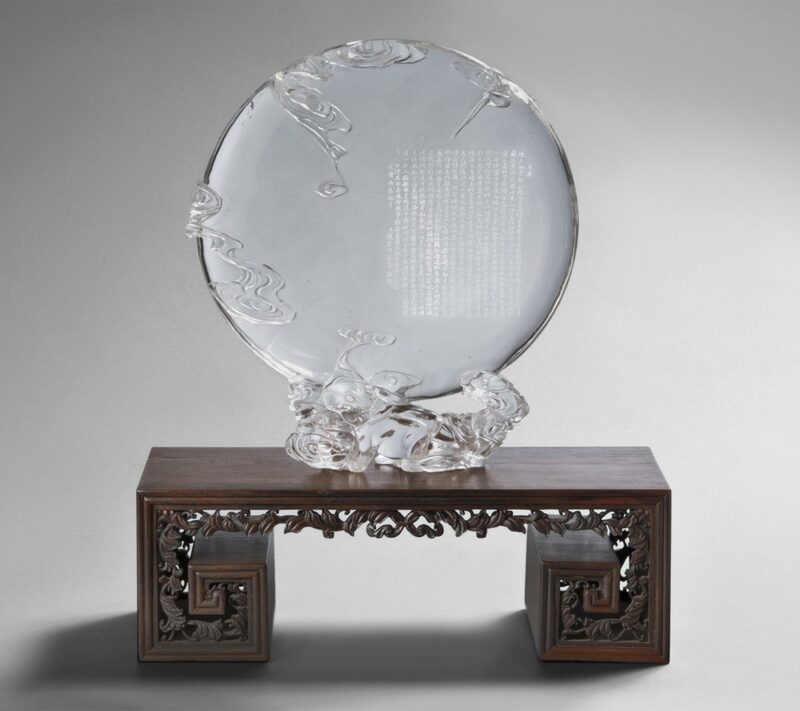 Rock crystal, a transparent form of the mineral quartz, was called "water essence" in early Chinese writings because of its resemblance to ice. It is a difficult medium to work: first the general shape must be sawed and chipped down, and then the detailed carving is done with a bow drill. Here the artist has mastered the technique to create a nearly flawless disk representing the moon. Clouds drift across its face, and it is supported on a base depicting the rabbit of Tao legend who lives in the moon and concocts the elixir of immortality. The fifth century prose poem incised on the surface tells of an ancient ruler who had parted from his beloved and found solace in moon gazing. It was cut into the crystal by the famous carver Zhao Pingzhong, who dated this work in the last year of the reign of the Qianlong emperor, a renowned patron of the arts and probably the original owner of the precious object. Felice Fischer, from Philadelphia Museum of Art: Handbook of the Collections (1995), p. 32.